George Washington led the American victory over Great Britain in the American Revolutionary War and was the first president of the United States. He lived from February 22, 1732 to December 14, 1799. 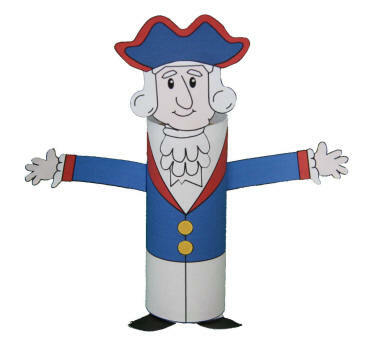 This is a fun and easy color, cut and paste craft that uses a toilet paper roll as a base to give the finished George Washington craft a three dimensional effect. This is a great craft to make for a President's Day or US history theme. Glue on the head at the top of the toilet paper roll so it fits in the V shape of the vest. Glue the hat on the head. Glue the arms on the side of the body. Glue the buttons onto the jacket.